Will you make small screamer pipes for the wastegates or don't they need them, looks like the have another vband on the outlet? $220 each is very reasonable. Nice looking setup Ben. Once I have the cash saved up I will definitely be adding one of your turbo setups to my carrera. Man, this really represents a great solution for performance Turbo exhausts - OEM toughness combined with ingenuity. as to hp anytime you bolt on a turbo setup properly tuned you are looking at 80-100hp gains easily with some mods way past that. trust me you won't want to go back to NA after that. Craig Thanks for the kind words I tried hard on this project to meet everybodies goals. I even made a slight mod for k27 965 cars so they can retain their stock bracket. An idea: instead of using twin wastegates (which might be a bit overkill on single-turbo setup), why not tap the pipe just prior to entering the turbo (at Y-intersection) and then draw it trough the single wastegate and dump it into exhaust pipe couple of inches after the turbo. 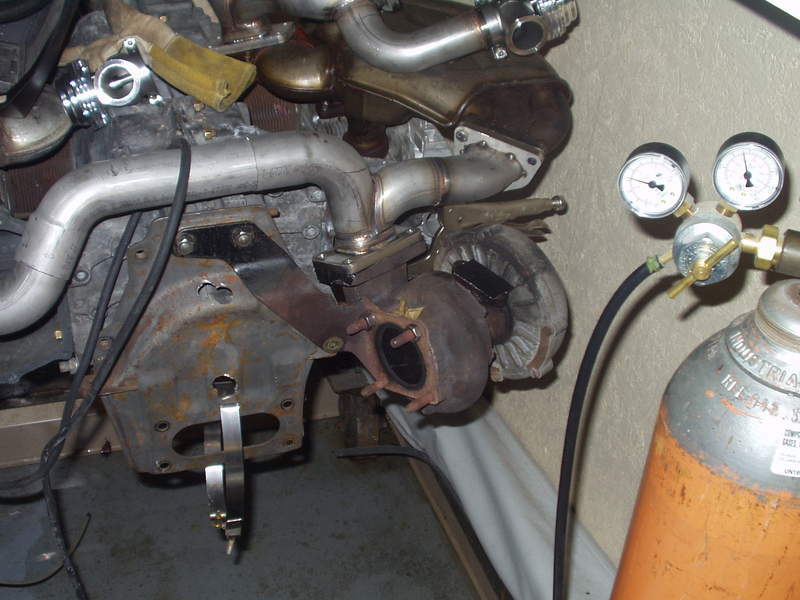 Reasons: Simpler/cheaper, only one wastegate. Will also weight less. It will require custom made downpipe from turbo but it would be really compact. Can you show a few more pictures of the final mock-up, as the one was cut off that shows the wastegates added to the system. Damn you're welding and pipe fabbing looks great. I like the way you are actually fixturing this to a bracketed turbo as well. I had lots of trouble with the GSF headers I got 2 years ago that placed the turbo about 1/4 to 1/2 inch out of original location. Made it impossible to bracket the turbo with the OEM support bracket and caused nightmares with intercooler plumbing. Keep us posted with progress. 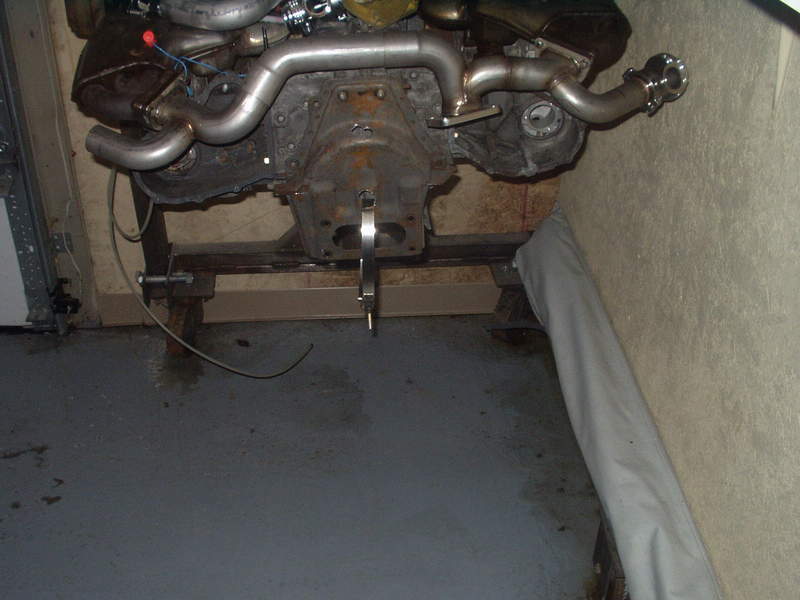 993 y with wastegates and bar springs are $1250 Heat exchangers with flipped flanges are $650. the kit for heat needs to be completed but I expect that to be in the 200ish range so how does that compare to B&B etc? You have to remeber this include wastegates so still very competive when you think that tial 46mm wastegates are$500 atop of the B&B or the others prices. As if you didn't have enough to worry about right now, I'd like to plant a seed. How about locating the turbo in the middle so the pipes from the HE to the turbo are equal length? I know it would require a different bracket, but for track days it could be a bolt on and the output of the turbo could simply be a zork pipe. I have a vision of the 935 setup, with a more normal sized turbo.